Cosmetic dentistry can transform teeth into a beautiful work of art. A brighter, bolder, and more attractive beaming smile can make you look younger, more vibrant, and improve your self-confidence! After all, recent studies have shown that people with straight, white teeth are perceived as more intelligent and trustworthy than their peers. With cosmetic dentistry from the skilled team at the dental office of Dr. Alan R. DeAngelo, you can let your smile and personality shine. Your cosmetic dentistry treatment will depend on what’s right for your individual needs. 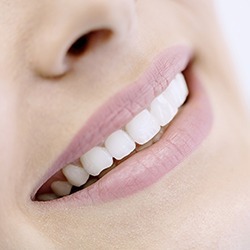 Porcelain veneers can create the look of an even row of teeth, and Invisalign clear braces shift teeth into their proper place for a healthy and beautiful outcome. 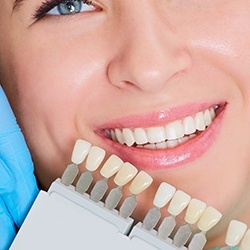 Crown and bridge services work well to replenish teeth that have been extracted or knocked out, and dental implants are used to recreate teeth down to the very root. 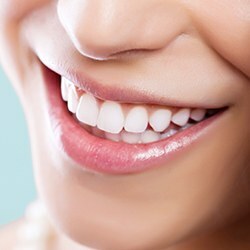 Professional teeth whitening lifts stains and brightens your overall look. Dr. DeAngelo will work with you at our Homer Glen dentist practice to effectively meet each of your preferences to create your ideal image. Contact us today to schedule your appointment at our Homer Glen practice. With a winning combination of technique, technology, and the finest porcelains available, I have been crafting some of the most beautiful smiles you'll ever see. 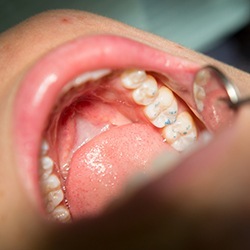 It has taken many hours of continuing education, including learning more about advanced techniques such as gingival recontouring, laser sculpting, and deep bleaching. In addition, I’ve mastered the art of working with electric handpieces for smooth preparations, experimentation with various blends of porcelains at some of the nation's finest dental labs, and utilizing modern metal-free and quality alloy materials to get the beautiful smile you deserve. Of course, it doesn't hurt that I have a steady hand, advanced knowledge of the dentition, and the ability to color match your existing teeth or create a new, whiter, brighter smile. Nice looking teeth are not enough for me. I have done high-quality cosmetic dentistry for years, but what was lacking was the "WOW" Factor. You know, the smile that makes you do a double take; the bright, beaming type of smile that catches your attention and the admiration of those around you. I’ve truly found it and my patients love it. Hugs, thank you’s, handshakes, and even tears of joy have become commonplace at my office and have not only enriched the lives of my patients but my life, too. Beautiful smiles: they're contagious. Don't take my word for it, though. Come into my office and ask to see some of our before and after photographs. I'll let my work speak for itself. You'll be happy you did. - Alan R. DeAngelo, DDS. If you feel that your smile is unpleasant or unattractive on a comprehensive scale, a personalized makeover here in Homer Glen can help you regain the self-confidence you deserve. Our team will work with you closely in order to determine your personal needs and goals and pinpoint the services needed to help you reach that point. We may recommend any number of cosmetic services, including ZOOM! 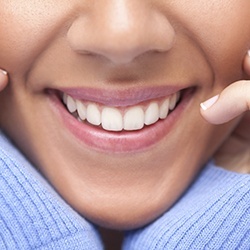 teeth whitening, porcelain veneers, Invisalign, gum recontouring, and more. 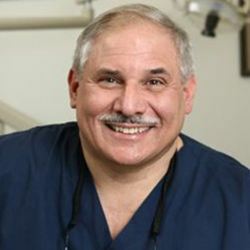 Dr. DeAngelo strongly believes that it’s never too late for patients to regain a complete and reliable smile, even after suffering from advanced decay or severe tooth loss. In these cases, he may recommend a full-mouth rehabilitation. 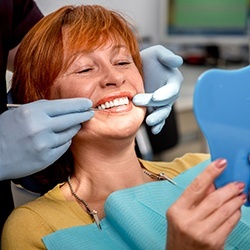 This process is similar to a smile makeover, but it focuses more on helping patients regain health and oral function. 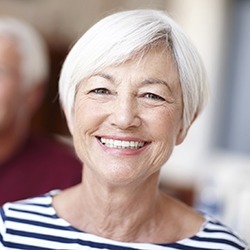 Our team may recommend dental implants, dental crowns, and bridges, orthodontics – whatever patients need to start living their lives to the fullest once more. Each porcelain veneer is custom-made and colored matched for every patient. You can get one to enhance a single tooth or an entire set to achieve a smile makeover. Everything from the foods and beverages we enjoy every day to aging and genetics can leave our smiles look stained, dull, and discolored. If you’re ready to make your smile shine again, then we can do it with powerful ZOOM! Teeth Whitening. This treatment combines a potent bleaching agent and a specially designed light to eliminate even the most stubborn stains in record time. It can make your smile up to 8 shades whiter with just one quick treatment! Dr. DeAngelo uses the upgraded Zoom White Speed! with no UV radiation for your protection and safety. Want to get a straighter smile without dealing with the hassle or appearance of metal braces? Now you can with Invisalign. 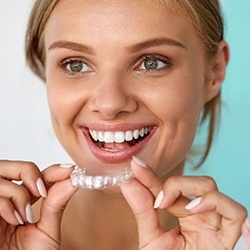 This revolutionary treatment uses nearly invisible clear plastic aligners to gradually straighten the teeth, giving you the ability to smile with confidence all throughout treatment. Plus, you can take the trays off whenever you need to eat or brush your teeth, giving the best when it comes to convenience as well. Our practice has been dedicated to using metal-free materials to repair teeth for decades, and the results speak for themselves. With metal-free all-porcelain dental crowns, we can easily repair broken and decayed teeth in such a way that it looks like nothing bad ever happened to them. The material is just as strong as real enamel and even reflects light in the same manner. Thanks to Dr. DeAngelo’s skill, he’ll make your dental work look completely unnoticeable. If you have small chips, cracks, gaps, or stains, then we can quickly fix them with direct bonding. Dr. DeAngelo will apply a liquid composite resin to your tooth, and layer by layer, he’ll sculpt it to perfection. With this treatment, he can easily improve the shape, size, and color of any tooth. Better yet, the entire procedure usually takes less than an hour, requires no anesthetic, and is extremely affordable. Do your teeth appear to be too short or stubby? Would you say that you have a “gummy” smile? If so, Dr. DeAngelo can make it a thing of the past thanks to laser dentistry. He has spent years training how to use the most advanced tools, and with a soft tissue laser, he’ll be able to painless remove any excess gum tissue and expose previous hidden dental structure. He can then shape your gum line along your teeth to give you that perfectly proportioned look. The old saying is, “Look before you leap,” right? Before you commit to a cosmetic treatment, we can give you a preview of the results using our Virtual Smile Design system. 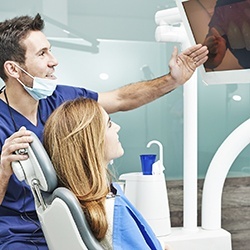 Using a digital photo of your smile, we’ll be able to modify it with our in-house software to show you what your smile will look like after a particular treatment. This will give you better idea of what to expect and also give you a chance to ask for any adjustments.